Ernie Barnes was an NFL football player who longed to make art. Finally his dream came true. 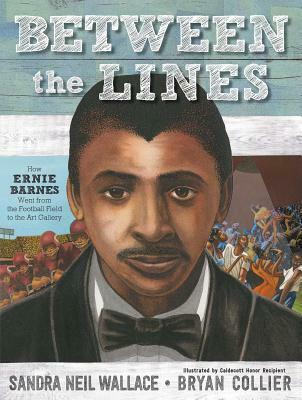 Between the Lines is a story of inspiration, spirit, and of an American original who pursued his dream. This enchanting picture book includes pieces of artwork created by this little known artist who captured the truth and beauty of the world he saw around him. Sandra Neil Wallace hopes that her stories inspire readers as much as they inspire her. Her most recent book, Blood Brother: Jonathan Daniels and His Sacrifice for Civil Rights, was an ALA Notable Book and a Chicago Public Library “Best of the Best.” Her novel, Muckers, was named a Booklist Top 10 Sports Book for Youth. Formerly, Sandra was an ESPN reporter and was the first woman to host an NHL broadcast. She lives in New Hampshire with her family. You can visit her at SandraNeilWallace.com. Bryan Collier is a beloved illustrator known for his unique style combining watercolor and detailed collage. He is a four-time Caldecott Honor recipient for Trombone Shorty, Dave the Potter, Martin’s Big Words, and Rosa. His books have won many other awards as well, including six Coretta Scott King Illustrator Awards. His recent books include By and By, Thurgood, The Five O’Clock Band, and Between the Lines. He lives in New York with his family.